Since 2010 a part of the Pelton-Round Butte hydro operation has been the selective water withdrawal, or fish tower. One purpose of the tower is to facilitate the downstream migration of fish such as salmon. The tower is part an overall effort to re-establish migrating salmon and steelhead above the Pelton-Round Butte system, owned and operated since 2000 by Portland General Electric and the Confederated Tribes. Fish passage was blocked when the dams were built in the 1950 and ‘60s, as the original fish passage design never worked. Part of the problem was the inability of downstream migrating fish to find their way through Lake Billy Chinook, because there was no downstream current. The selective water withdrawal tower helps create a surface current in the lake by drawing water from the top of the lake. Regarding temperature, the cooler water is at the bottom of the lake, and the warmer at the top. The tower allows the project managers to mix these waters as they released through the dam. The intent is to match what would be the natural temperature downstream during various times of year. In the early 2000s these and other aspects of the fish recovery effort were key parts of Pelton-Round Butte Federal Energy Regulatory Commission relicensing process. 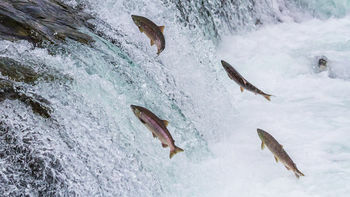 The intent at the time, as it remains today, is to bring salmon back to habitat in the Upper Deschutes basin for future generations, said Tribal Councilman Raymond Tsumpti. In 2016 a group, the Maupin-based Deschutes River Alliance, sued PGE alleging violations of the federal Clean Water Act in the operation of Pelton-Round Butte, especially the selective water withdrawal tower. The Confederated Tribes were not named as party to the lawsuit, though the tribes have participated in the case in defense of the operation of the fish passage facility. Recently in court, PGE argued that the tribes, as co-owner–operators, are an essential party to the suit. But the tribes cannot be joined because of tribal sovereign immunity; so the case should be dismissed, PGE argued. This shows clear and unequivocal Congressional intent to allow a tribe to be subject to jurisdiction under the Clean Water Act citizen suit provision, the judge found. So the case can go forward. The Deschutes River Alliance alleges that operation of the fish tower has resulted in more than 1,000 violations of the Clean Water Act, mainly regarding downstream temperatures. So an aspect of the case can be seen as advocates of resident trout populations, river guides, for instance; versus the effort to restore the upstream salmon, the intent of the tribes. And for the migrating fish, the selective water withdrawal tower is working, as salmon have been returning for some several years now, said Bobby Brunoe, general manager of the Branch of Natural Resources. This entry was posted in Business, Health. Bookmark the permalink.